Dream On Me Jax Universal Changing Table is perfect for any nursery. This changing table has a clean modern line design, with a water resistant mattress pad for changing and including a safety strap with a fully enclosed dressing area for extra security. 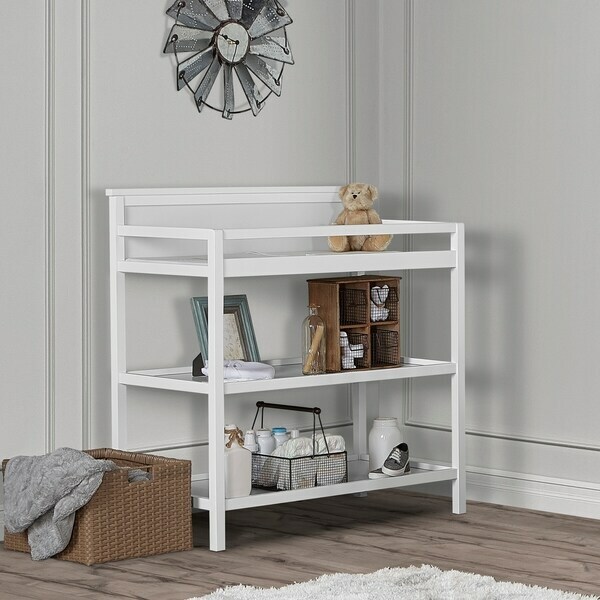 Dream On Me Jax changing table has 2 fixed shelves for open storage which is ideal for diapers, wipes and other essentials. This changing table can transition into a nightstand, as your baby gets older. Dream On Me Jax changing table coordinates with All Dream On Me Crib. All Dream On Me products meets or exceeds government and ASTM safety Standard. Tested for lead and other toxic elements to meet government ASTM and the CPSC standards. Coordinates with Dream On Cribs. Find tips and inspiration to create the coolest teen bedroom. Shop our huge selection of teen bedding and furniture at Overstock.com. Create a space for learning and fun. Check out these playroom ideas for your home. Shop our huge selection of baby & kids’ furniture at Overstock.com. Kids' Furniture Buying Guide from Overstock.com. Our guides provide customers with information about kids' furniture. How to Choose Fun Kids' Furniture from Overstock.com. Create an exciting bedroom for your children with these tips on choosing fun furntiure. Farmhouse decor embodies the simple comforts of a country home. Capture the lived-in charm of farmhouse style with these decorating techniques.